Came across this on a recipe book but I couldn’t remember or jot down it's recipe. So I decided to try & make my own version. I do not know how the original taste like but mine not too bad, I quite like it…it's appetizing! Steam aubergine for 15-20mins or until softened. Peel the skin away when cool down & arrange on a serving dish. Sprinkle the spring onions, chillies & egg before squeezing the lime/lemon juice evenly on top. Heat oil in a small frying pan, add shrimps & garlic. Fry until golden. Pour on top. 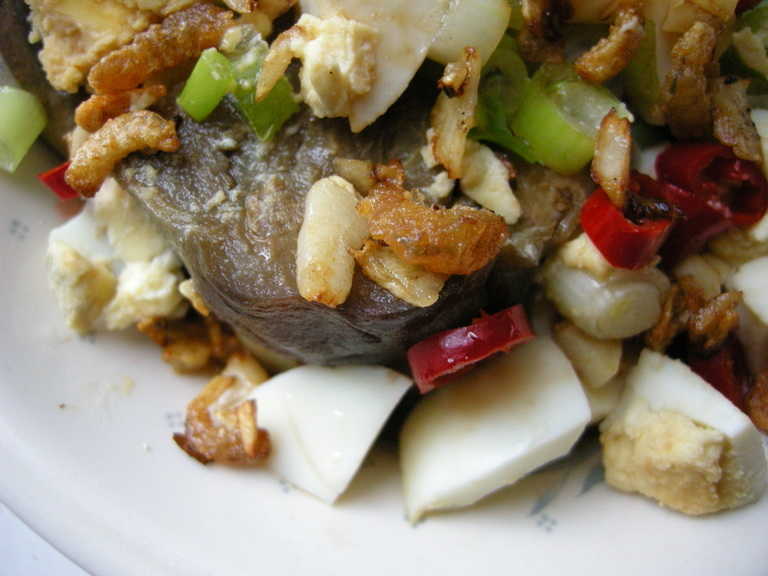 Add shaoxing wine & light soy sauce to the dish before serving.